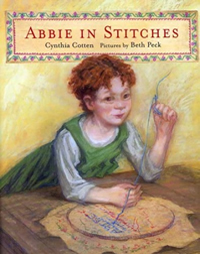 It's the early 1800s, and Abbie's sister, Sarah, is a proper young lady who loves needlework. She has already made a sampler displaying her neat and even stitching. But when it becomes time for Abbie to make her sampler, she despairs—she hates needlework and would much rather curl up with one of the books on Papa's shelf. How will she ever get through the long, tedious hours of needlework? And how can she pick a subject for a picture to sew when she really doesn't care about the sampler at all? After considering what's really important to her, Abbie completes the sampler in a way that is all her own. A teaching guide is available for this book.